My tutor suggested me to look into the drawings of Richard Diebenkorn (1922-1993) and his use of tone and control. I included him already in my research on townscapes. In this research I will look more into his ink and watercolour drawings of day to day things and more figurative works. I am quite eager to learn more about more expressive ways to manage ink and washes. From previous exercises I tried some but still more tentatively. Still struggling with the midtones. But I like the otherwise sharp edges that can be achieved with ink and a brush. How to combine pen and brush with ink and washes I hope to get some insight with this research. Beside the great book on Richard Diebenkorn (Livingston, 1997) I consulted the learning blog from the Ohio Wesleyan University dedicated to their students on the Frank Hobbs’ Drawing courses (and all others involved in the practice of drawing like me). => This work is quite interesting to me as it combines watercolor for wash and ink (for line and wash?). 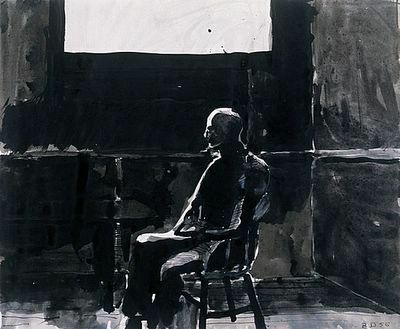 I can see that Diebenkorn applied ink with a pen and a brush. Overall this seems to me a combination of drawing and painting. Although the mark makings more pronounced. This picture consists mainly out of mid tones, blacks rather for outlines or cast shadows. I think he applied several washes on top of each other to obtain darker tonal values. => A line drawing with brown washes, not in ink but in watercolour with line medium (conté and charcoal). Bold simple shapes, washed effect on receding forms (door, wall) and patterns in watercolor on foreground objects (plaid?). In the focus point slightly off centre a frame with some drawings sticked to it. I am wondering whether Diebenkorn put the charcoal at the end or before the application of watercolor. Till now I was always struggling with watercolor on top of charcoal that the charcoal just get washed away. Perhaps with intermediate fixative layers. Have to try more. Overall, this is combined image of representational and more abstract patterns that fits well for a balanced composition and to create a sense of visual depth. => fascinating the bold contrast of white and black and the midtones on the wall and the floor. The bright light through the window reflected on the front outline of the sitting person. This reminds me a bit to the London works of John Virtue with white outline of the otherwise black buildings. The composition is framed through the paper surface, the cut off window, and the rectangular shapes on the wall. I am impressed in his control of achieving and maintaining the fine white lines within the dark washed picture. Something definitely I am going to test myself. Several washes layered to obtain desired tonal value. Combination of lines drawing with washes in rather abstract pattern for visual depth perception and balanced composition. Sharp edges and fines lines with ink and brush is possible. Bold contrast of black ink with only a few outlines left blank on the paper gives impressive visual effect.